According to The New Grove Masters of Italian Opera, Donizetti wrote 65 operas. His first four were considered student works, one of which was not performed until 1960 and another awaits a premiere. His career can really only be considered to have taken off with his fifth listed opera Zoraida di Gratia, premiered in 1822. In the following 21 years he wrote 61 operas plus various radical revisions as were required by the exigencies of singers available at revivals, or the demands of particular theatre managements. This constitutes a prodigious output, exceeding even Rossini�s 39 operas in 19 years, and achieved despite lacking his distinguished predecessor�s speed of composition or gift of melodic invention. With Maria Stuarda and Lucia di Lammermoor, both premiered in 1835, Donizetti�s fame was secure. Two years later, during the composition of Roberto Devereux, his son was still-born. This was the third post partum death his wife had suffered. She followed her son to the grave a few weeks later. In my review of Opera Rara�s recently issued recording of Roberto I suggested that these deaths were related to the syphilis Donizetti was carrying. The tertiary stage of this disease reduced him to paralysis, insanity and in 1848, death. He was only 51 years of age and he died a mere five years after his last opera. The impact of these personal tragedies seems to have triggered a great impetus of creative energy. In the remaining five years of his creative life he wrote thirteen new operas. Like Rossini before him he conquered Paris with his operas simultaneously performed at four of the city�s theatres. His significant new works for Paris included La fille du régiment, premiered at the Opéra Comique on February 11th 1840, and La Favorite at the Opéra the following December. Unlike Rossini, Donizetti did not settle in Paris. He went there in hopes of earning enough money to escape the hectic world of opera houses, and like his great predecessor, to retire early. But as his health started to decline he clung to his career. He was solicited to consider a post in Vienna as Kapellmeister to the Austrian Court. Captivated by Vienna, his newest opera Linda di Chamounix was premiered there on May 18th 1842. Linda di Chamounix is compositionally a curious mixture. In it Donizetti returns to the opera seria genre abandoned ten years before. The opera relates a complex story with all the elements of bel canto including a musically complex overture, a wonderful love duet and a mad scene for the heroine. Perhaps the most unusual feature is that the nasty would-be seducer of the chaste Linda is cast for a buffa bass, who gets a patter aria as well! On this Arts issue each of the three acts is contained on one disc. No track-related synopsis is provided; nor is there a plot summary divided into acts. This is a pity as the details of the plot are not to be found in the average opera reference book either. The plot is outlined below. Act I (CD 1). The Departure from Chamounix. Linda�s parents, peasants living in the mountain village of Chamounix, are concerned that a pursuing aristocrat, the Marquis Boisfleury, might threaten their daughter�s chastity. The Marquis is the brother of their landlord and they are also worried about the renewal of their lease (CD 1 trs. 2-3). The Marquis visits the house and seeks to make Linda�s acquaintance (trs. 3-4). Linda loves, and is loved by, Carlo (trs. 6-7 and 10-12) who is passing himself off as a painter. In reality he is the Visconte di Sirval, the aristocratic nephew of her would-be seducer. On her way to a rendezvous with Carlo, Linda meets the orphan Pierotto, a young musician who is leaving for Paris. Linda asks him to play her his latest melody, which she finds curiously disturbing (trs. 9-10). It is necessary for the young people of the village to go to Paris in the winter to earn money when there is no work for them at home. Linda meets Carlo who expresses the wish to remain in the village with Linda (trs. 10-12). The local prefect and Antonio, Linda�s father, decide it is better for Linda to go to Paris with the other young people so as to avoid the Marquis�s intentions (trs. 13-15). In the act�s finale the populace greet those who are leaving and the prefect invokes heaven�s protection upon them (trs. 16-17). Act 2 (CD 2). Paris. Carlo has revealed his identity to Linda and offered to provide for her until the day of their marriage. Linda has accepted and is now living in a luxurious home. Hearing Pierotto�s playing she invites him in. He gives her news of home and congratulates her on her forthcoming marriage (trs. 1-2). The Marquis arrives having discovered her new home. He offers her a finer house and more money. Insulted Linda orders him to leave (trs. 3-5). Carlo then arrives. He is desperate because his mother has ordered him to abandon Linda and marry an aristocrat (trs. 6-7). When Linda comes in he doesn�t have the heart to tell her the truth (tr. 9). Her father arrives in Paris seeking Linda but does not recognise her in her finery. When he does, he thinks the worst and curses her. Pierotto arrives with the news of Carlo�s wedding. The news is too much for Linda who goes mad. Pierotto leads her from the house (trs. 10-11). Act 3 (CD 3). The Return to Chamounix. A spring day and the young people are returning to the village from Paris. They are welcomed by the populace (tr. 1). Pierotto and Linda are not among them. The prefect is lamenting for Linda�s father when Carlo tells him he has refused the arranged marriage and his mother has consented to his marrying Linda. The prefect tells him of Linda�s state and Carlo swears to be faithful to her forever (trs. 2-3). The Marquis arranges for a wedding (trs. 4-5). Pierotto and Linda arrive, she still in madness and nearly unconscious. Only Pierotto�s music has kept her going (tr. 7). The prefect hurries for Linda�s parents but she does not recognise them. Pierotto suggests that she will recognise his music and Carlo speaks to her (tr. 8). Linda replies that the real Carlo would have spoken other words to her at which he sings the refrain from their first act love duet. Linda joins in, recognises Carlo, and is returned to sanity. Everyone celebrates (trs. 9-11). The plot is excessively sugary. Despite the fact that the rapid reversal from tragedy to happy ending is rather too much for dramatic verisimilitude, the opera is rich in lyricism and structural innovation. It offers much good mature Donizetti and scarcely deserves its neglect in the theatre and on record. Although Joan Sutherland recorded the aria and cabaletta Ah tardi troppo�O luce di quest anima (CD 1 tr. 7, here) and the love duet, with Pavarotti from a live concert, she never performed the role on stage nor did she record it. The only other recordings of the work I know are of a 1972 live performance from La Scala and the 1993 Nightingale issue with Edita Gruberova, also recorded live. Although well cast, the La Scala issue is in poor sound. Gruberova�s is a brilliantly sung assumption, but overall her cast does not match that on this issue, which is conducted with élan by Gabriele Bellini. Despite the lack of theatre staging there have been notable concert performances including one in New York in 1992, conducted by Eve Queler and another in London in 1998 under Mark Elder�s baton. Both of those performances received critical acclaim but neither has appeared on disc. Famously the Met staged the work for Lily Pons in the 1930s. 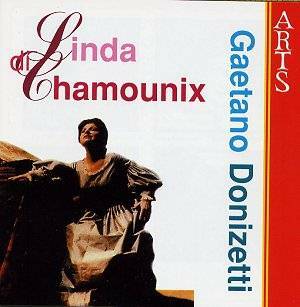 Linda di Chamounix is an ideal opera for an expressive lyric coloratura soprano. The Italian Mariella Devia sings the part with lyrical grace and fine characterisation. Her coloratura is an integral part of her voice and interpretation. Her legato and phrasing are secure as is her trill. She does not go overboard in conveying Linda�s madness. Hers is an appropriate and affecting interpretation. Her solo recit and cavatina (CD 1 trs. 6-7) and duet with Carlo (CD 1 trs. 10-12) are particularly pleasing as is her duet with the smooth-toned, beautifully sung and well characterised Pierotto of Sonia Ganassi (CD 2 trs. 1-2). Luca Cononici sings Linda�s lover Carlo. His is an open-toned even voice and although he doesn�t match the ever-elegant Alfredo Kraus on the La Scala recording he is never less than satisfactory. I hope that isn�t damning with faint praise. It is not intended to. He is appropriately tentative in the act two duet but there are times when he could gainfully have softened his tone. The reminder of the cast are all up to their tasks. Alfonso Antoniozzi, as the Marquis, manages his patter well, whilst Petteri Salomaa as Antonio and Boguslaw Fiksinski as The Prefect sing with strong true tone as does Francesca Provvisionato in the small part of Linda�s mother. The chorus sing with clarity and vibrancy. The booklet essay, in English, German, French and Italian, is mainly concerned with the evolution of Donizetti�s operas through the genres of semi-seria and giocosa; there is some comment on the structure of Linda. In passing the essay gives an indication of the plot. The libretto is given in full without translation. Even if there were well-recorded studio competition this performance with its clear and well-balanced acoustic characteristics would be competitive. There is no such competition. Fashion has long dictated that this work is amongst the least known of the Donizetti oeuvre. Given the fine performance and budget price I recommend every lover of the bel canto genre to go out and buy it. Now. It is superb mature Donizetti well performed. I cannot envisage another studio recording in the near or distant future so why wait?